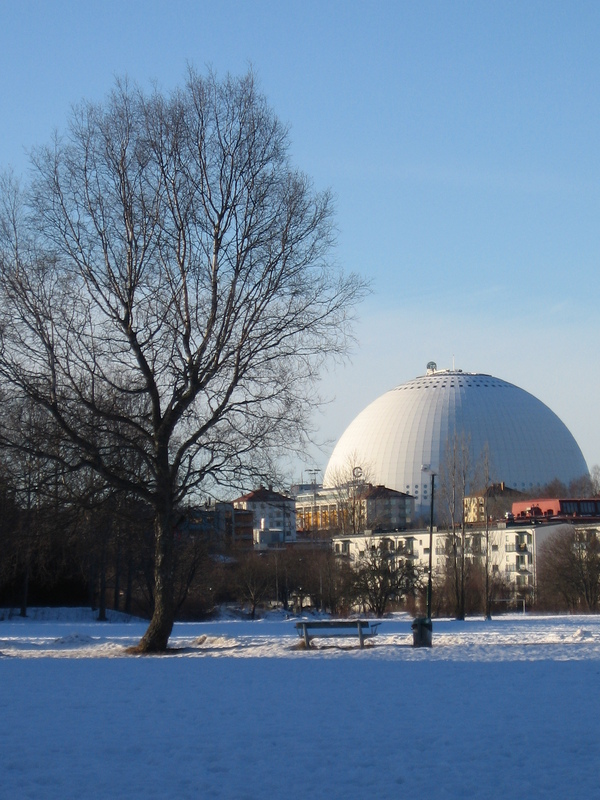 I started my walk from home towards two food shop named ICA and Coop Konsum. My pocket camera with me because I would like to capture the sunny day but zero degree Celcius. 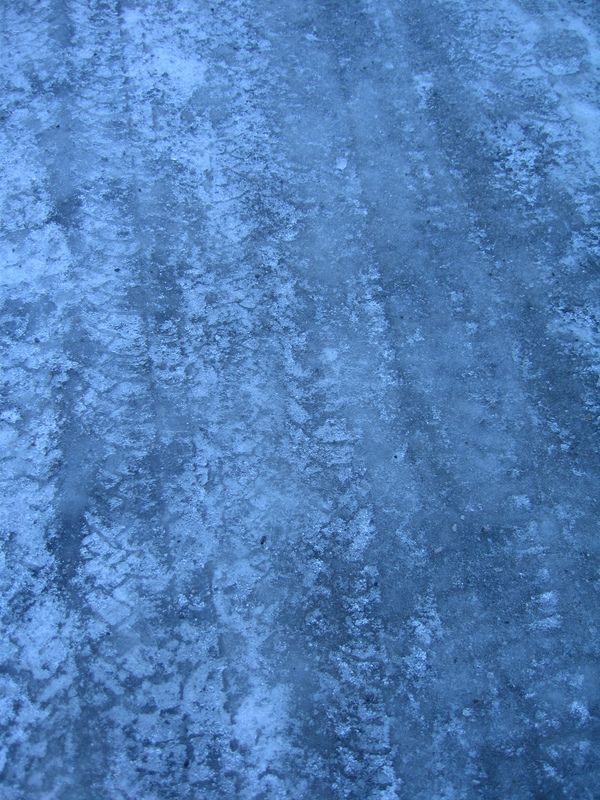 As I suspected that the road and footh path covered by ice. It was a slip truck in front of me on the way to the food shop. 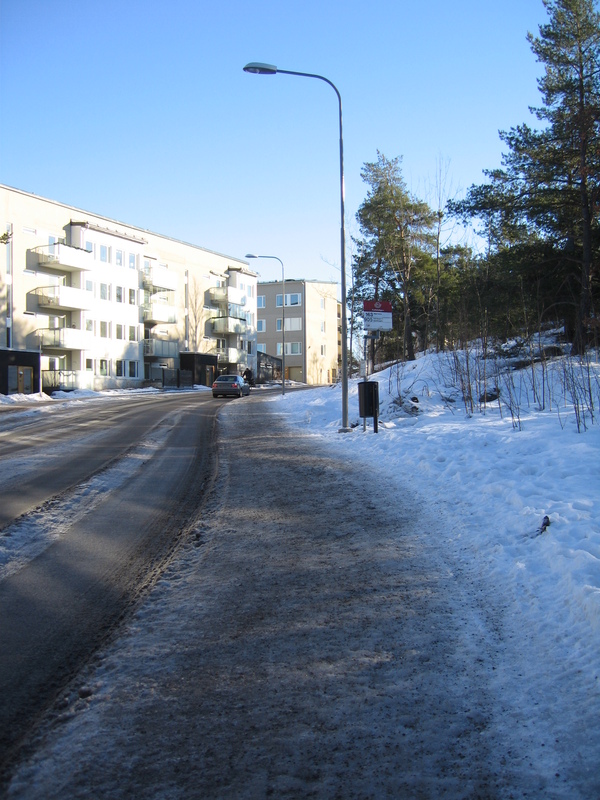 Yes… even to have a walk, the road is quite slippery as you see in the picture on the left side. I don’t see many people outside, maybe because they are in the office, school or maybe at home and stay warm in this kind of weather. I dropped some clothes of us that we don’t use it anymore in one green box which is belong to Eric Hjälpen, organisation that collect unwanted clothes to give it to them who need it. 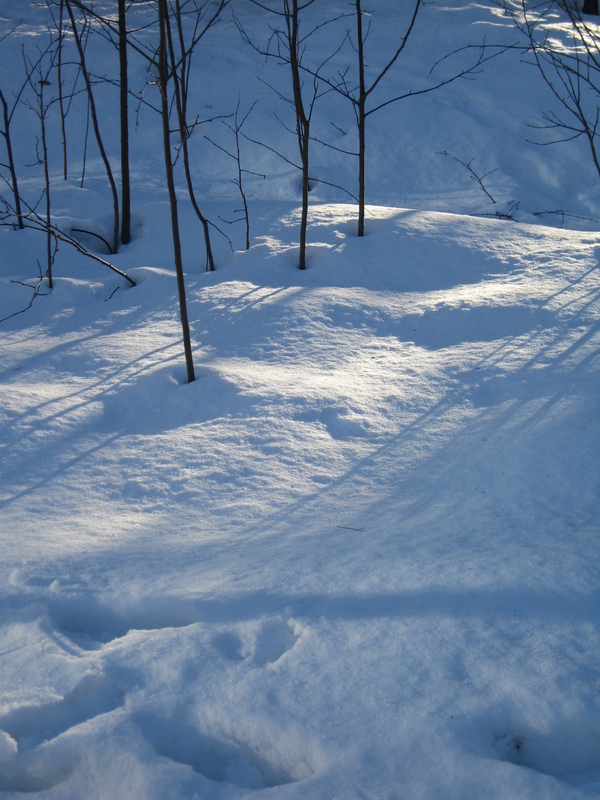 I took snaps of flats and a small forest by the road to show that it is a sunny day and some snow is still pure white without having any chocolate colour on it. 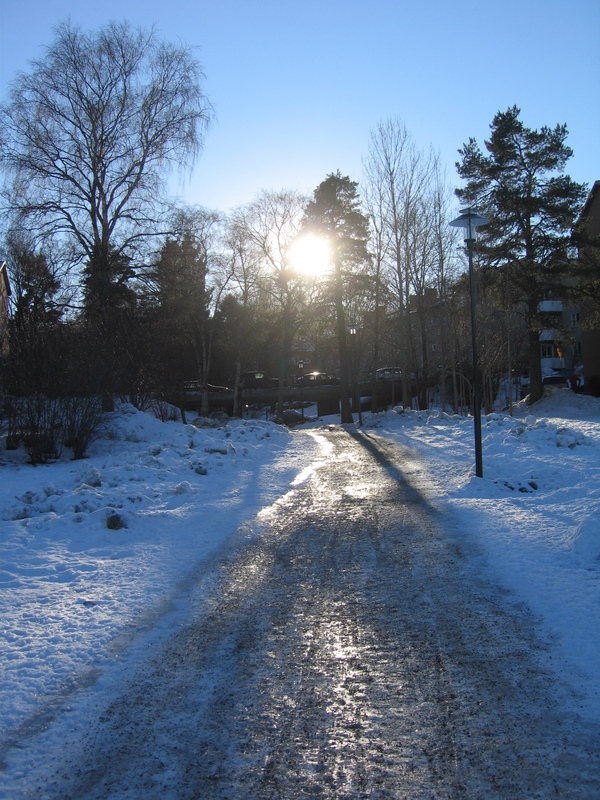 They are not the best pictures but at least it shows one of many areas in Stockholm in winter time… sunny but cold 🙂 I continued my journey first to ICA and bought some milk, margarine and Iceberg lettuce for dinner tonight. The next stop was Coop Konsum and I bought 2 type of bread for breakfast and some Proviva yoghurt. Why went I to two shops which located side by side? My answer will be, the bread in Copp Konsum was cheaper today for the member card holder, I saved around 15 kronor for those bread. Yes, I know… 15 kronor might not a big deal for some people but my princip is “If we can get a cheaper bread with same quality, why should we pay more?” Sound silly but hey… it won’t cost me anything to just get one from one shop and get in to the other shop 😀 It took me only 1 second to do that and you see how much money I saved LOL!!! My trip was continued…. I took a different road on the way back home. It is not a footh path that I used to take but I need a bit longer distance to enjoy the nature and get some fresh air. 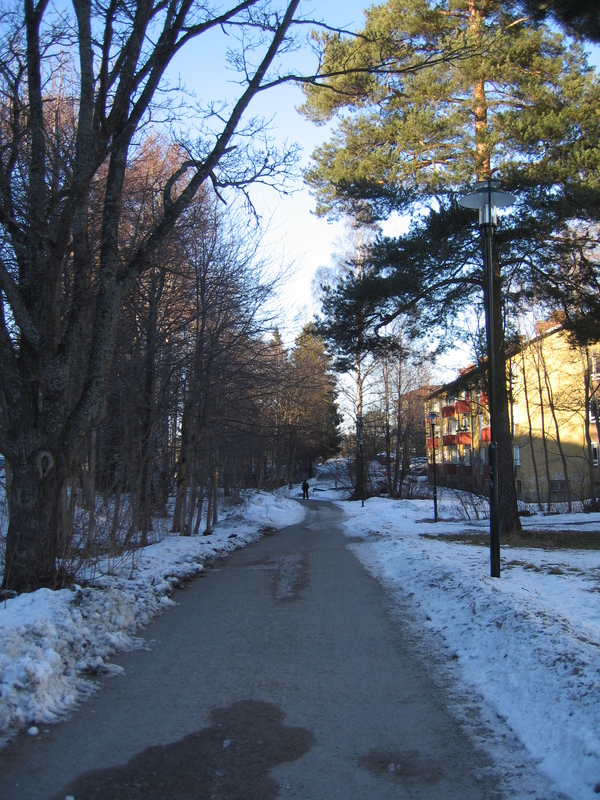 As you see it was a nice footh path without ice on it and this will lead me to a huge park which is located the opposite of our flat. Again… there was no one I saw walking or passing by. Many block of flats are located along this footh path and usually there are many activities happen in this road when the summer come. 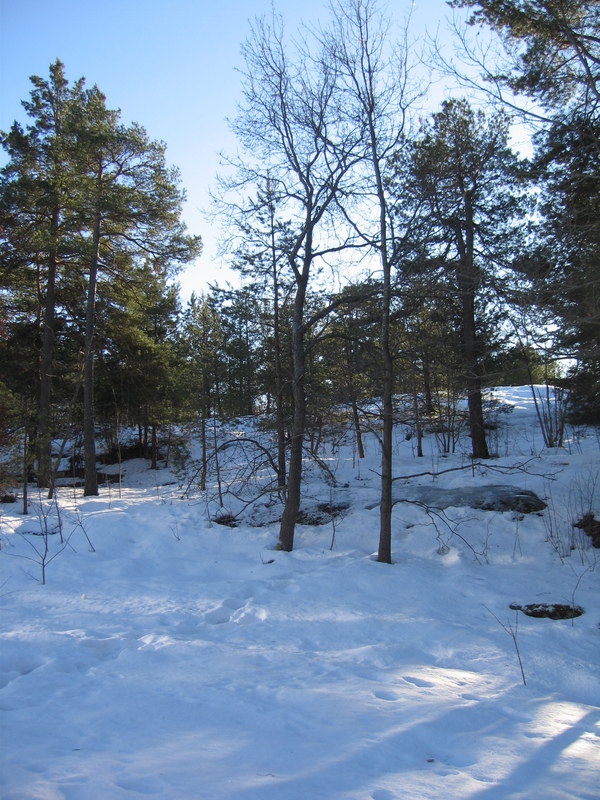 Last month, this was covered by snow and now seemed we will have a real spring time ‘I corssed my fingers for that’. 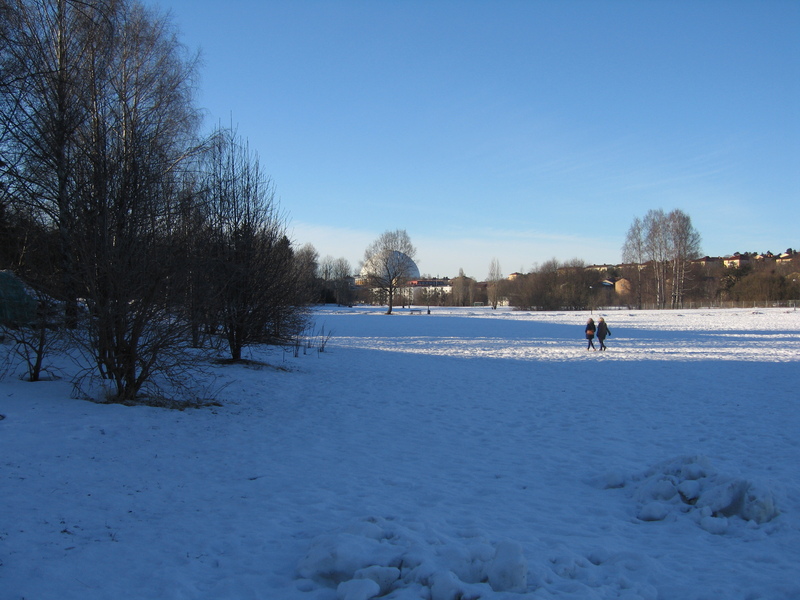 I remembered that last year we had a very short spring and I think after such a long and heavy winter, most of people want to have it where we don’t need to wear a thick jacket, gloves and hat. Yeah… we will see! We can’t do anything if it is regarding nature, we only can hope that the sun is coming back in day by day basis.While I was walking, my hands were busy to take some pictures using my camera that has only a couple minutes life 🙂 The park completely white and I saw two teenagers passed me and busy talking. This entry was posted in every day, travel. Bookmark the permalink.